Responsible Wood is set to travel to New Zealand as impetus builds towards a historic joint Australian and New Zealand standard for Sustainable Forest Management. Meeting with New Zealand government officials, the New Zealand Green Building Council and a range of PEFC accredited Sustainable Forest Management and Chain of Custody scheme holders, Responsible Wood will tour New Zealand; visiting Wellington, Napier, Gisborne and Auckland in the week commencing Monday, February 18th 2019. In just two short years since the establishment of the New Zealand PEFC forest certification, the New Zealand standard for Sustainable Forest Management now covers more than 27% of all New Zealand planted forest available for production. 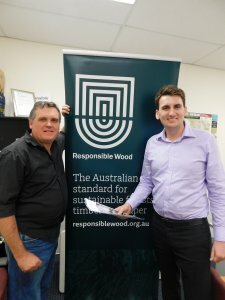 “PEFC and Responsible Wood, the Australian endorsed PEFC forest certification scheme, now has a growing footprint in the Australian and New Zealand market places; with the push towards a Joint Australian and New Zealand standard certification is an invaluable tool to verify the origins of timber and paper at the source and in the forest,” Mr Ross said. Speaking about the proposed Trans-Tasman standard, Simon Dorries, CEO, has been impressed by the response of stakeholders to the call for nominations to participate in the standard review committee. “Under the proposed joint standard, forest growers will be able to operate using the same standard in both markets,” Mr Dorries said. And Responsible Wood is supporting ambitious talk with action. Responsible Wood will attend the New Zealand Wood Processors and Manufacturers (WPMA) Conference in April. Hosted in Christchurch the conference will draw timber and wood processors from across New Zealand.